Community Edition is free and features basic dashboards, a simple query system, and rudimentary packaged reporting. Unlike the paid editions, installation and setup are required along with PHP, a webserver, and a database. Sugar Professional costs $35 per user per month and adds a deeper CRM feature set, integration with social media and third-party apps, an online support portal, and dedicated Android and iOS mobile apps. This edition comes with 15GB of document storage space. Sugar Enterprise costs $60 per user per month and adds line item opportunity management, additional forecasting options, customer portals, and customizable activity streams. This edition comes with 60GB of document storage space and supports up to two sandboxes. Sugar Ultimate costs $150 per user per month. It has basically the same feature set as Sugar Enterprise aside from 250GB of document storage space and support for up to five sandboxes. Sugar’s Private Cloud is included in this edition, whereas in Sugar Enterprise it is available only as a paid add-on. It should be noted that all paid editions in the SugarCRM pricing model require a minimum subscription term of one year.2 Sugar Professional and Sugar Enterprise also require a minimum of ten users. This means that the price points on each of the paid editions are actually higher than that listed. Sugar Professional would cost $4,200 for ten users per year and Sugar Enterprise would cost $7,200 for ten users per year. For companies with less than ten employees, Sugar Ultimate can become the most cost-effective solution at $1,800 per user per year. In addition, SugarCRM focuses only on customer management, leaving other critical business processes such as project management and invoicing to be handled by third-party apps. Licensing additional apps for these processes can further inflate company expenses and add a substantial amount of time to training, onboarding, and system implementation. WORK[etc]’s takes care of both problems through a holistic approach to business management that lets you thoroughly manage the entire customer lifecycle. You can get a lead, turn it into a contact, create and roll out projects, bill your customers, and provide support using only one scalable cloud-based app — and you don’t even have to sign a lengthy one-year contract to get it. 1. “CRM Software packages and Pricing”. SugarCRM.com. Retrieved August 27, 2014. 2. 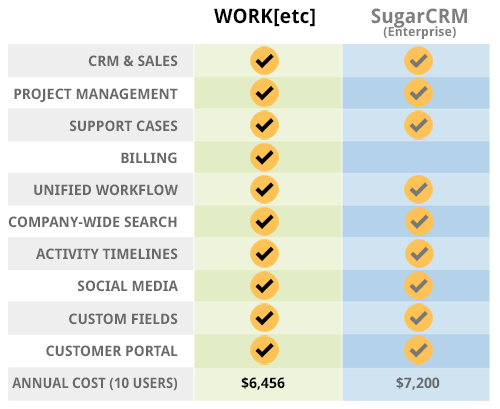 “SugarCRM Editions Comparison Chart”. Cloudfront.com. Retrieved August 27, 2014. SugarCRM is a registered trademark of SugarCRM in the United States, the European Union, and other countries.